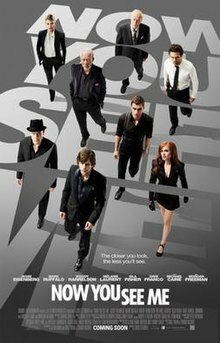 Four magicians (played by Jesse Eisenberg, Isla Fisher, Woody Harrelson, and Dave Franco) are united and start pulling off bank robberies during performances and reward their audiences with the money. Meanwhile, an FBI agent (played by Mark Ruffalo) and an Interpol agent (played by Melanie Laurent), are assigned to track down these illusionists. This movie also stars Oscar winners Michael Caine and Morgan Freeman. I saw this movie this week and I have to admit, it was better than I expected. The first ten or fifteen minutes of the movie are pretty boring and did not pull me in, and I thought that the rest of the movie will also be like this, but later it starts getting more interesting and thrilling. The cast is pretty good, and so is the directing and most of the story. I think that the best actor in the movie was Woody Harrelson, because he was the most entertaining and fun to watch here. The movie’s script sometimes does not work throughout the movie and often the plot makes little sense, but at the end it is very enjoyable and different than just any crime film. It would be worth watching, and I would especially recommend it for fans of crime and heist movies. ← Can you believe it? FilmToppings now has 100 posts! I enjoyed it becuase of it’s action but I understand why you didn’t like it. By the way, if you don’t follow my blog via email already then you should.